The Key System series has a time machine look into the Bay area. Displaying the trolleys within the context of operating era. All forms of period transportation are included. The old films are deftly combined with a wealth of local history. A fascinating journey into the past is available to any viewer- railfan or not. Here is a PBS style program, with a comprehensive history of the Key System empire. Charles Smiley has arranged a wide selection of sources, to deliver an intensive explanation of what was, the electrified Oakland to San Francisco commuter system. Linking to San Francisco, first via ferryboat, and culminating in Bay Bridge rail crossing, the line was closed in 1958. An inclusion of BART film from 1973, and how some of that systems construction, was brainstormed by Key executives many years earlier, ties it all together. The multiple sources, and varying media, deliver a fascinating show. There is a majority of color film. Black and white footage, plus still photos offer the photography aspect. There are some drawings for Borax Smith’s discovery, and brilliant developement of Borax products. Background music livens things up along the way. Live synced sound is also included. San Francisco is part of the story. Combining both cities history into an engaging show. One of my favorite segments is at Treasure Island. The Golden Gate Exposition in 1939. Brilliant 16 mm delivers a superior visit to that 1939 World’s Fair. Some night photography, and some bright neon signage, offers a glimpse, into some less renowned exhibits. Another interesting aspect, are the vintage rides on the system. Plenty of interesting views. I really enjoy time machine portions, like the commuter rides. See how the cities appeared in those decades. ride the rails on the Bay Bridge. Check the vehicular traffic, present in the street scenes, as time progresses forward. All the lines are visited. Original streetcars, that used to feed the Key’s main interurbans, are viewed and put into proper historical context. See that trolley fleet after retirement, literally…. put out to pasture. Evolution of commuter equipment is complete. Fleet conversion to bridge units. Electrified buses, shown side by side, in operation with catenary interurbans. You may wonder… how did he acquire all of the assorted films? National Car Lines takeover of the Key System is examined in-depth, as you would expect from Charles Smiley! The NCL acquisition and the goals by the companies behind the scenes is quite informative. Los Angeles also had NCL occupation.. There is much more than the small amount shared here. Oakland Oaks and San Francisco Seals service, before Major League baseball came to town is one. Southern Pacific commuter service, and trackage absorption by Key, is also involved in the story. San Francisco and the Muni trolleys are the only ones left of the once vast electrified network. A look at that systems equipment, rounds out the program. There are a great many views from a large number of sources. Film quality is generally excellent to very good. The films are shot well and look good. It is surprising, just how much of the fims are in color. CSP custom-made maps, are very helpful in reviewing the complex network of trackage. Also, the ensuing changes over time. The map here is one of many within the program. This one denotes the Key’s lettered interurban service, and the green indicates, the smaller trolley network that fed into the mains. That is just one map. 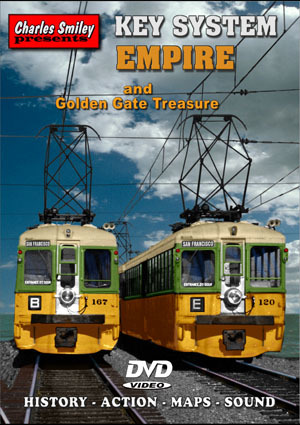 Charles Smiley has a complete overview of the East Bay commuter service, with the Key System on this DVD. There are two additional volumes in the series. They are also reviewed on this site. Each Key System program is a window to a past world. This show is another outstanding one from Charles Smiley Presents. This entry was posted in ATVR Reviews, Charles Smiley Presents and tagged American Train Video Reviews, California, electric, Emery Gulash, Railroad, Southern Pacific, Train DVD by William J. Hudson. Bookmark the permalink.